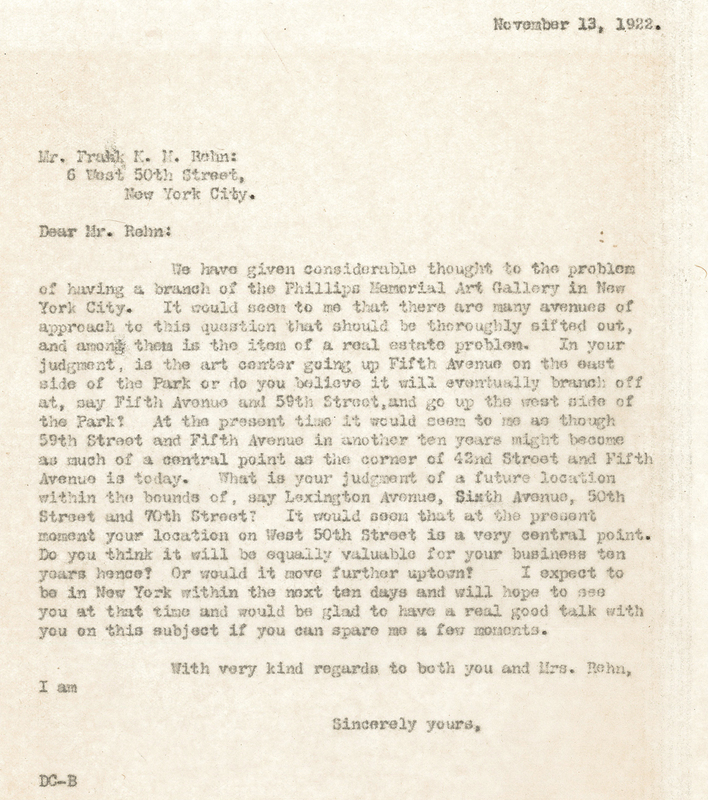 In 1922, one year after The Phillips Collection opened to the public, Duncan Phillips explored the idea of opening a branch of the museum in New York. He reached out to Frank Rehn, a gallery owner, and A.C. Downing, Jr., of the New York Trust Company, for advice. Phillips’s treasurer, Dwight Clark, inquired about the location of the future art center of New York and specifically asked for information on the value of properties on 57th Street between Lexington Avenue and Sutton Place as well as within the bounds of Lexington Avenue, Sixth Avenue, 50th Street, and 70th Street. The New York branch never came to be because Phillips decided to make acquisitions of works of art a priority. Phillips paid $125,000 for The Luncheon of the Boating Party in 1923, which exhausted the funds needed for purchases as well as real estate.